Decisions, we make hundreds of them everyday. Little ones. We decide to get up (or not). To shower, dress, choose to make this or that for breakfast, lunch or dinner. To write. To go to work. To ask for help when we need it. Decisions — hundreds, all the time that we don’t think about — we just do them, go through the motions. But they’re all decisions and choices. Then there’s the big ones. The ones we fret and worry and think about. The ones that wake us up in the middle of night, heart pounding, wondering, Should I or shouldn’t I? If I do, what if this happens? If I don’t, what if that happens? Those big, life-changing ones that well, change your life. We’ve all made those big fat life changers. To get married. To live with someone. To make a commitment. To move to another place. To quit a job, take a chance. Reinvent ourselves. Or sometimes, because we don’t make them, something happens that forces us to do so. Several years ago, I was living in a city far from my family, on my own. My Mom sent me an ad from a newspaper where they all lived and suggested I apply on it. I wasn’t that happy, but I had built up plenty of walls and I wanted it to stay that way. I was fiercely independent and it’d taken me awhile to get there. Had she sent me that ad on another day, I would’ve thrown it away. But that particular day, I decided, what the heck, I’ll apply. I did, they called and I drove over 400 miles for the interview. I drove back and had a message on my answering machine when I got home. They wanted me, out of several applicants, they wanted me. I had to be there in two weeks. I fretted and meditated and prayed and consulted the I Ching, went to a psychic. 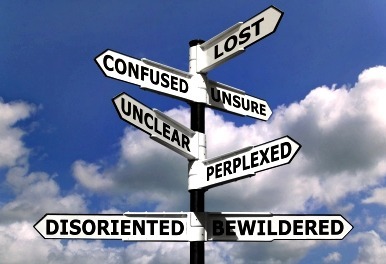 I did alot of things to try to get signs from someone somewhere to make my decision. Then, it dawned on me that the decision was made — the moment I sent my resume. What were the odds of that happening? What did I have to lose? So I rented a U-haul that I thought would hold all my belongings (it didn’t) and then I had to make the decision to just leave the stuff that wouldn’t fit in there behind. I gave it away — furniture, food, plants, whatever — I gave it all away. That’s when I began leaving money in drawers — you know for the new occupants that would live in the place I left. I thought that would make someone happy when they found it, maybe help them make a decision. Sometimes it’d be a dollar or two, sometimes five, ten, twenty, whatever I could leave. I’ve done that to this day. It’s good karma, I think. I think that major decision helped me to make other big ones. I’m not saying I’ve not fretted and worried over making them. Hubby and I have moved several times since we’ve been together — sometimes we’ve made the decision to do so and sometimes the decision was made for us. But, ultimately, the decision, the choice was mine, his, ours. That’s the beauty of it. Really, only we can make those decisions and choices that make our live turn out this way or that way and how we react to the results of those decisions/choices is maybe even more important. Little ones and big fat life changers that get us to where we need to be, want to go or where we end up at this moment of our lives. Then sometimes, I think the right decision is not making one at all. Even that, is a decision. To wait. To reflect. Then when you do make that big decision to know that if you’re weren’t supposed to do it, well then you probably wouldn’t be doing it, would you? Happy Monday everyone and enjoy some Beatles this morning. you are inspiring Dear Brigitte…and thoughtful. How do you do it? Just try to write what’s in my heart/soul (hope that doesn’t sound too hokey) but it’s the truth. Your saying that means more to me that you know, dear UFBS. I just love your stuff and how it makes me think. Those big fat life changes really do shape who we are. Love the leaving money idea, so cool. Hey Simon! Always wonderful to see you here and thanks so much for your nice comment. You know, I think about someone finding that — little bit of money/change whatever and how they go — Oh, look — money! You know like when you find some in your pocket that you forgot about. It does kinda make one happy, huh? Thank you!! Great post, Brigitte! I’ve been living in ‘Limbo Land’ for the past year or so. I’ve been in a figurative log jam (not that you would think I was in a literal log jam…ha!) At this point, I’m feeling a bad decision is better than no decision. I just need movement. Does that make sense? I think sometimes we put so much importance on decisions that they feel like life and death and then they start to cause anxiety. Most decisions in life, let’s face it, are not written in cement. We can always change even if it causes a little inconvenience. Change can be scary as hell and most of us try to avoid it. But if you don’t take a chance now and then life gets stagnant and we cease to grow. What you say makes PERFECT sense, Grippy. That limbo place is so tough but teaches us things, does that make sense? They do feel like life and death, but change is one thing that is a sure thing. So glad you liked the post and thank you for your nice comment. I made one of those big fat life changes that absolutely set a whole series of other opportunities and decisions in motion. However, sometimes I still struggle with the not-quite-as-big-but-still-too-big-to-decide-on-a-coin-toss decisions. Like when I was choosing whether to send my son to Kindergarten, I flip-flopped and decided on something several times before the decision was finally essentially made for me. I try to learn to quiet my mind, think about the long-term goal and allow the pieces to fall into place. It’s difficult sometimes. Thanks for the post! Hi Ruth…that’s always the way isn’t it? Everyone struggles with those, that’s human nature I think. That quieting the mind I think is one of the most difficult things to do! When we finally do though, it’s always amazing what happens. Thanks so much for stopping by and your comment – it’s much appreciated. Hi Big Smile — that’s what I try to think as well. It’s definitely not easy, but your wise words are so true. So glad you loved the post and hope you have a great day as well. Hi Sally — so glad sometime leapt out at you and hopefully helped in some small way. Thank you for your nice comment! From now on I’m just going to call you Guru Brigitte. You are wise and witty and wonderful. Oh, Madame, how nice. Don’t have all the answers really, just the contents of my head sometimes, you know? Thank you so much, friend — my heart is full. Thanks,Carrie! That decision you made seems to working out quite wonderfully for you. See, you just proved my point — thank you, writer-friend. There is really no such thing as a big decision or a little decision, because each decision shifts our position from what it was before and opens a new realm of possibilities for us. And, as you so astutely point out, making no decision is also a choice. Perhaps we need to free ourselves from the concept of big and little decisions. For example, deciding what to have for breakfast could be a life-altering experience (and if it is, I want to know what you’re having!) and getting married may simply be the logical next step…make the choice, and if you don’t like the way things turn out, make another choice, and another, and another until you get the result you’re going for. If you stop and think about it, that’s really what we do anyway. It’s never about any single decision. Yes, as humans, we are definitely results oriented and motivated. We’ve forgotten how to just BE. Great post! In the immortal words of the band Rush (am I showing my age? 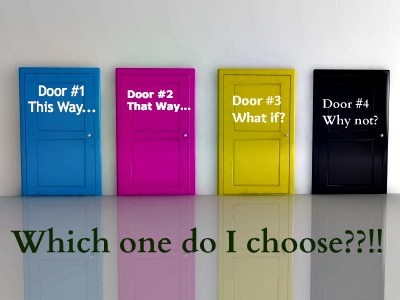 ;-)), “If you choose not to decide, you still have made a choice!” Thanks for another thoughtful post! You’re most welcome. Thank you for your thoughtful comment. Thanks so much craves, here’s to a great week! This is such a great post to get me thinking on a more positive track (which tomorrow’s post may not reflect)! Thanks, JM. Post away — some days we are positive others we’re not. That’s not a bad thing, that’s a human thing. Glad I got you to thinking on a more positive note, though! Great Monday Post! Decisions can be so daunting, but change is good…and life is like a river, always moving, flowing, ebbing, and sometimes throwing you off a waterfall. But then you’re moving once again, even if you don’t want to…and more decisions must be made…and we must grow. Yada yada yada. You already said it better than me. Hi Char! Thanks for that. I like your analogy and your yada, yada, yada. 😉 Have a great Monday. Thought provoking! 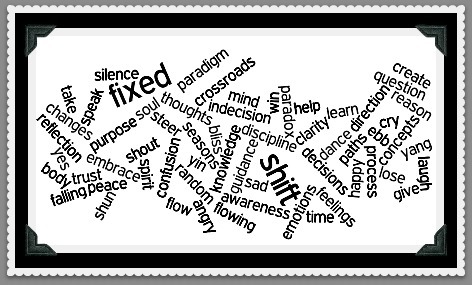 I tried to write something once about “too many choices” and how too many choices can often lead to disappointment b/c we are often left wondering “what if there was something better out there?” Conversely, if we only have a few choices and make a decision it seems we are happier b/c we made the best choice with what we had to choose from. Let me know if you want the link… it might be easier to understand that way. Hi Britta! So nice to hear from you! I feel that too many choices thing when I go down the cereal aisle in the grocery store. ;). I know what you mean though, it’s maddening sometimes try to figure out just what the right decision/choice is but whether it’s “right” or “wrong” things have a way of getting you back on the path you need to be on — does that make sense at all? And yes, I’d love the link — always welcome great writing with a message. So great to see you here again and thank you. Oooh, Thank you. I’m reading it now. Wonderful!! Wonderful. One reason I enjoy coming here is that your outlook seems very positive, and not the brittle, “psych-myself-up” positivity that seems so prevalent these days and hits me with the intensity of fingernails on my emotional chalkboard. You seem genuinely happy, which is a very pleasing characteristic, I think. Regarding your final statement about choices unmade–I think that for me personally (because I don’t generally believe in ‘one-size-fits-all philosophies’), the right thing to do is almost always to make the choice. Somewhere in your post you said something (in slightly different words) which I believe very much: if you don’t make the choice, life makes the choice for you. It’s very easy for me to do that–to just drift and let circumstances dictate my path, but that’s not right for me. 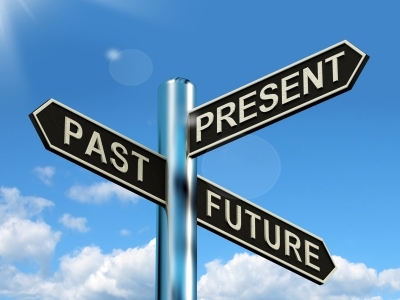 I also like the idea (if I’m hearing you right) that the choices we made in life are the right choices, because they brought us to where we are now. I’m not sure if I agree with that completely (and again, I may have completely missed your point on this part), because I can think of hypothetical situations where that wouldn’t be true, but it is true largely for my life. I have made mistakes–ghastly mistakes, even–but they have led me to where I am today, and in that respect, although I endeavor not to repeat them, I’m glad I made them. Hey Smak my friend! So nice to see you here. I guess I am genuinely happy for the most part. I don’t leap out bed in the morning whistling with bluebirds flying around and I have my days like every one else. I know what mean about the psych-myself-up stuff you speak of and agree with you. You can’t be that all the time and sometimes you don’t feel like it — you just ride through those times. When I was in college, there were times when I did leap out of bed in the morning whistling with bluebirds flying around me, but that was mostly chemical. Ha!!! Did you mean talking out of your a*s. See, the little star thing makes it okay. I hear ya, sister and know exactly what you mean. Glad you enjoyed. Okey dokey. Let the dust settle then. Big ones take time. :). Why thank you Fish!! :). Great post! Want to know something funny? Well not funny, weird really…..I usually make the big decisions quickly and rarely second guess them. It’s the little things that keep me awake at night…..weird, right? No not weird. We’re all different animals and everything’s relative chickie. :). oh yes, not weird to me, I do the same 🙂 Annoying huh? No not annoying at all!! I so agree with you, Sue. The freedom that we have to make them — H*ll yes. Glad you enjoyed the post and am looking forward to your next one. :). This whole post is so true and definitely strikes a chord with me. I also made a big move about 9 months ago, making the decision to leave everything I knew and come to a place where I had nothing and no one (well, there are relatives but you know what I mean). Before I left, I also agonized over whether it was the right thing to do but realized that as people were asking me what my future plans were, I kept unconsciously telling people that I was “probably” going to make a big move soon. Clearly my subconscious already knew before I did. I’ve had my moments in doubting whether this was the “right” decision or not but regardless, I made a choice and I’m sticking with it (until I move on to the next big life changer decision 😉 ). Great post! Hi L — so glad you enjoyed. It seems as if many people can relate to this choice/decision thing and I do know what you mean about not knowing anyone. Been there many times — I’m glad you made a choice though because then all sorts of juicy, wonderful things can happen, right? Thank you for your nice comment and stopping by. Oh this is really something that hits home! I feel like I’ve had to make so many of these big decisions in the past – switching careers, jobs, choosing to stay in Singapore instead of going back to Australia… and I’m the kind of guy that would have difficulty choosing a drink at a coffee shop! Oh, the same thing happened to me, 12 years ago now. I was in a big city, 8 hours from home, independent, resilient and walled. Then my Mum rang up one day and offered me a job. If she had offered me a job a month before I would have laughed at her. But on this day, I didn’t. A month later, with my stuff all packed, friends fare-welled, and my boyfriend of 4 months in the car with me, off we went. I have never regretted it. Wow, it sounds like we have much in common, Sara! I never regretted it either. Thanks for your comment and for stopping by. I’ve always been the “make it happen” type, but it’s funny, once, when I lived in Denver, I took some time (six months) to reflect, detox from a crappy job and wait to see what came my way….then one day the best job I’ve ever had sort of fell from the sky right into my arms. That was then. Now I wonder if there are any big “life changer” decisions left for me. Wow, Honie…you should blog about that the best job falling from the sky…I would love to hear that and I’m sure your other followers would too! I guess that’s just life — a series of big and small ones. It’s how we adapt I guess that matters the most. Nice to hear from you and look forward to your next POST!!!! It’s always so nice to come and visit your blog. Really enjoyed reading this post. The line that really jumped out at me was, “then, it dawned on me that the decision was made — the moment I sent my resume.” Sometimes when we think we are vacillating between the pros and cons we don’t even realize that we have already set in motion a chain reaction that is leading us towards our path. Oh, I have a secret habit (not so secret anymore ; ) of not picking up change I see on the floor, tables, etc., because i think maybe the next person needs it more than I do. Hi Nareen, thank you for your nice comment and so appreciate your stopping by. Glad you enjoyed the post! :). Ha! That’s certainly one way. Avoidance. Good at that myself sometimes. 😉 Thanks, Vikki. God, you are such a good writer. And you put one of my all-time favorite songs in as well. Thank you, I needed this.